Amid ideal weather for Family Day on Saturday, our Middle School, JV and varsity teams took to the fields and the tennis courts. With more than 1000 fans in attendance, the Knights delivered big, recording wins in all of the competitive matchups. 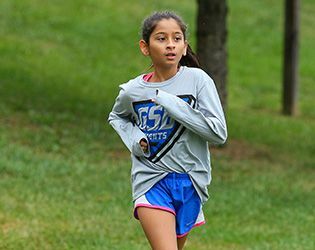 In varsity cross country, the boys' and girls' teams ran against Immaculata and Wardlaw Hartridge, but without a full complement of runners on the opposing teams, an official meet could not be held. On the boys' squad, Bobby D’Angelo '18 finished first, Matt Petit '17 second and Matt D'Ovidio '19 placed fourth. For the girls, Nicole Johnson '18 finished first and Sammy Bittman '17 finished third. In JV soccer, the boys defeated Immaculata 2-1, with Andrew Moglianesi '19 scoring both goals. Goalie Mitch Fishbein '19 contributed five saves to the win. The girls' team won 6-3 over Imaculata, with Emily Raia '20 and Eve Ryan '19 each scoring twice, and freshmen Ally Stevens and Teresa Zimmer adding one goal apiece. In Middle School competition, the boys' 7-8 soccer team defeated Wardlaw Hartridge 3-0, with two goals from Adam Berrocal '21 and one from Avery Kirby '21. The girls' 7-8 team also won over Wardlaw, with Isabel Orazietti '21 scoring the lone goal on a penalty kick. Girls' tennis bested Wardlaw 3-1, and cross country completed the middle school sweep, with both the boys' and girls' teams recording the win. Top finishers for the boys were Graeme Hollingshead '21, Andrew Young '21, Brendan Halstead '23 and Ryan Getzoff '23 in the top four spots. Top finishers for the girls were Lucie Antonius '21 and Emma Ryan '22, claiming the top two spots. Congratulation to all of our athletes. Go Knights! Stay tuned for a story on the dedication of our new Field House.